The spoils from Wanganui’s traditional opening two-year-old event for the new racing season are heading back to Cambridge. 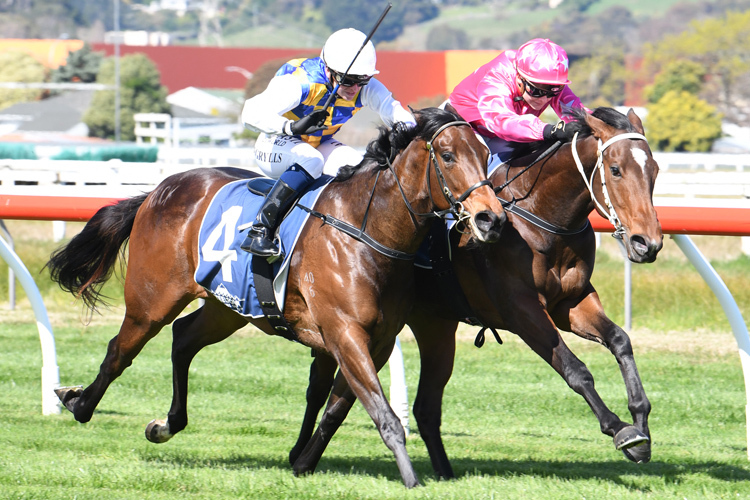 A brace of trial wins at Te Teko last month saw the Stephen Marsh trained Sai Fah sent out a warm favourite in the five-horse field for the 4 f dash and the Rios colt didn’t disappoint in a head-to-head battle over the final 1 f with eventual runner-up, First Rock. Despite being clearly headed by First Rock, Sai Fah fought back in dogged fashion to reclaim the lead in the shadows of the finishing post to score by a half-length with Alto Potenza finishing off well for third. “He’s so honest and just loves the game,” Marsh said after the race. “I thought it was a very game run as he looked well and truly beaten at the furlong and especially at the 0. He kicked back good and you love those horses that put one hundred and twenty percent in every time. Although not known as a trainer that produces his two-year-olds so early in the season, Marsh was quietly confident he had more ammunition to come over the next few months. “We might have a few nice ones lined up behind him so it’s quite exciting for the things to come,” he said. Runner-up First Rock was brave in defeat as she tried to put the initial win on the board for the first crop of her Westbury Stud based sire El Roca, as was the third-placed Alto Potenza who was representing the first crop of Rich Hill Stud stallion, Proisir.